Petrolicious recently released a new video exploring the Porsche 914-6. The Porsche 914 was released in 1969 and was a collaborative effort between Porsche and Volkswagen. The vehicle had seating for two and featured a 4-cylinder boxer engine provided the power, while the 914-6 had more power with the six cylinder, 911 engine. In Europe the 914s were badged as Volkswagen/Porsche, while all 914’s sold in were sold under the Porsche brand. Jack Griffin, who is profiled in the Petrolicious video, has an interesting story about his experience with the 914 and has owned his 914-6 for over 38 years. Here’s another great classic car video from Petrolicious about Mr. Winston Dabbs, who has combined a passion for the world of British cars along with a career in automotive restoration. Set in Compton, California, the video provides a glimpse into Winston’s 25 year romance with his regal looking 1955 Jaguar XK140. Back in December, we posted coverage on Urban Outlaw, a video bio about the life of Magnus Walker, the famed LA based, rebel Porsche customizer. Well, recently we came across another epic story we want to share that adds to the mystique of the sports car from Deutschland’s city of Stuttgart. A fiction writer by trade, Jack Olsen taught himself how to work on cars while also building himself the ultimate garage called the 12-Gauge Garage. 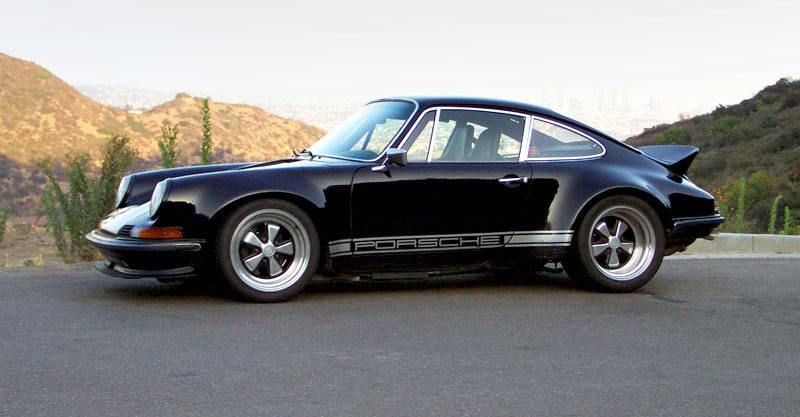 Inside this magnificent garage, he has created a beautiful one-off Porsche 911 called Black Beauty II. Upon first glance, Jack’s Porsche looks like a sixties or seventies model but actually, it combines four decades of 911 parts ranging from 1965 through to 2000. Comprised of a lightweight body from 1972, the transaxle from 1977, the brakes from a 1986 Turbo and the engine from 1995 model it truly is one of a kind. And with a fighting weight of only 2,400 pounds and 272 horsepower at the crank, the old girl can really move around the track. But the truly amazing part of this story is how this Porsche does it all – whether it’s trips with the family to 7-11, Sunday afternoon drives or full-fledged track days, Jack uses this car to do what it was designed for – drive smooth and fast. In today’s age of Trailer Queens and Barrett-Jackson auctions, Jack’s passion and purity of using his sports car is truly inspiring. It also helps that Jack lives in sunny California with its spectacular roads and tracks all within a short drive. To experience this awesome Porsche for yourself take some time to watch the video below.